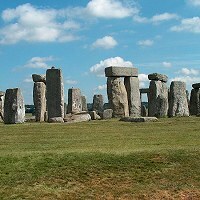 Archaeologists have discovered a second henge at Stonehenge, described as the most exciting find there in 50 years. Archaeologists conducting a multi-million pound study believe timber posts were in the pits. Project leader Professor Vince Gaffney, from the University of Birmingham, said the discovery was exceptional. The new "henge" - which means a circular monument dating to Neolithic and Bronze Ages - is situated about 900m (2,950ft) from the giant stones on Salisbury Plain. Images show it has two entrances on the north-east and south-west sides and inside the circle is a burial mound on top which appeared much later, Professor Gaffney said.